Our alpacas are sheared once a year, the fleeces carefully sorted and sent to the mill to produce the double-knitting yarns available here. (You can also buy them in Knit One, in Eldon Square, Dolgellau.) DK yarns in brown, cream and black. 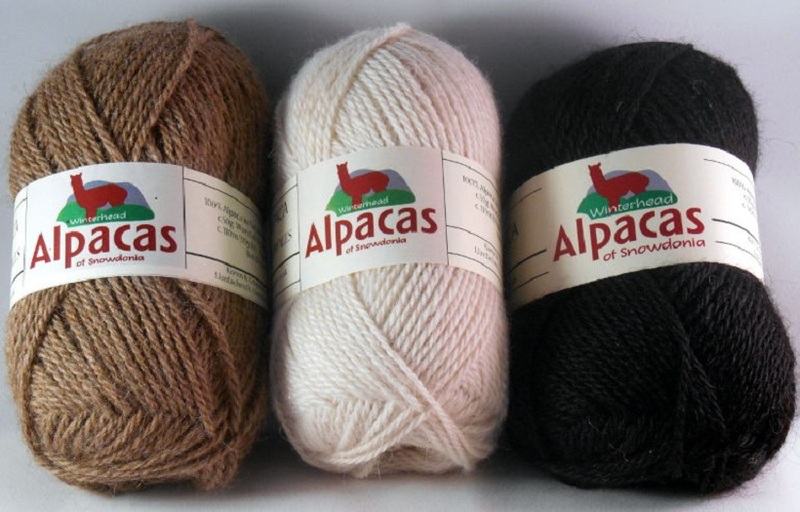 The three colours – brown, black and cream – are all natural, undyed colours therefore the exact shade will vary from year to year as the herd composition changes. If there are more fawn alpacas than white ones born one year, for example, then the cream the following year may be a little darker. We love this natural variation and look forward to seeing what is produced each time, but if you are working on a large project and need the same shade throughout, we strongly recommend you order enough at the start! All balls of one colour ordered together will be from the same batch. Composition: 100% alpaca, approx 50g Worsted Double-Knitting Weight. Length: approx. 110m (119yards). Hand wash, knit as DK. For a limited time, postage within the UK is free!